Remedies is an ever morphing project that wants to manifest people’s perceptions related to health and well-being. It has been touring around the world starting from Sweden (2011) to New Zealand (2015), Australia (2015), Haiti (2016) and Russia (2016). In Germany the project focuses on communal expressions that contradict with the secular and spiritual matters of everyday life. The project invites 5-6 participants from diverse background to meet a medium in a public session. During the public session all participants are invited to sit veiled (anonymously) around a table in a darkened room. The medium will consult each participant accordingly. The audience will gather around the participants. 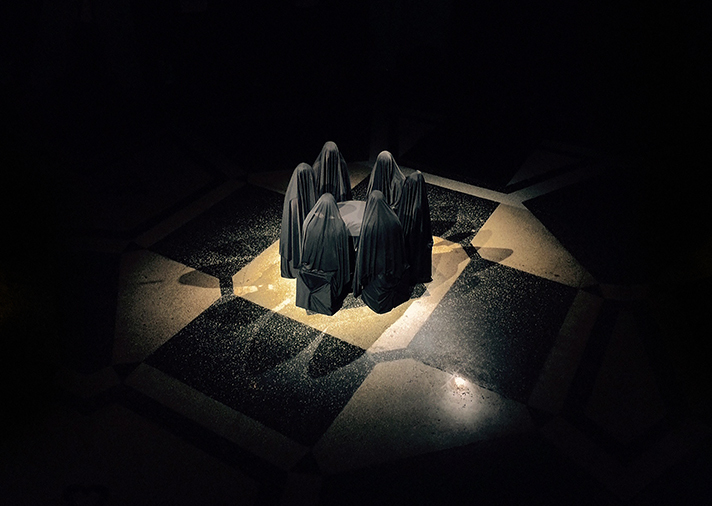 This performance took place during the exhibition THE INCANTATION OF THE DISQUIETING MUSE On Divinity, Supra-Realities or the Exorcisement of Witchery's - INVOCATIONS performance program co-curated by Nathalie Mba Bikoro.